I sense the Lord saying, "Just stop for a moment, on this gigantic mountain you are climbing, and take a look at the view..."
What we have been experiencing in our nation these last three years, has been overwhelming. It has been hard. It still is. Many are feeling weary. But it's in this time, now, that the Lord would say to us, "look for those patches of blue within the dark-covered sky; Search out those hidden meadows, that are laden with my beauty, and see what I AM doing!" There has been something bubbling away in hearts and ministries all over the land that our Father has now brought to the fore, for such a time as this, through Whitestone Surgery. Based in Nuneaton, Warwickshire, Whitestone Surgery is headed up by born again believer, Sacha Simon. Within the last 12 months, the ground-breaking "social prescription" services his surgery have provided have gained significant exposure on the BBC news and have reached governmental level. Statistics were aired comparing the amount of prescription drugs handed out by Whitestone Surgery for depression, as being at least half that of any other surgery in the country. Let us ponder on the economic and social benefits of this! Whitestone's social prescription blueprint is now operating throughout Warwickshire and is spreading into the West Midlands. This is wonderful news! Let us give thanks to our GOD, celebrate what He is doing and pray for this growth to continue to spread throughout our land at an exponential rate! "Search out those hidden meadows that are laden with my beauty..."
- I believe the Spirit of God would also say, "seek to network and encourage one another". Linda owns a salon that reaches out to the mentally ill and those with dementia, in London. Taking her ministry into residential and care homes, Linda shares the joy she feels when those who would normally just be in their rooms, dare to venture out and engage with others. Linda has testified how people have walked into her salon and for the time they are there, they are in their right minds! Hallelujah! Ex-army officer Dawn runs an initiative in S. Wales for isolated people. She shares testimony of how many souls have been transformed as a result of coming to 'The HUB'. Some have begun going to Church and some have even managed to step back into working life. It is so important that in the midst of hard times, we do not lose perspective. When we see what the Spirit of El Shaddai is doing, it causes hope to rise and faith to be ignited. Then we will pray prayers of faith and it is faith that pleases The Father! The Spirit of GOD says to us, "SEE THE BUDS SPRINGING FORTH! Even as you are transitioning from Winter to Spring, so it is within your nation!" Let hope and faith arise! 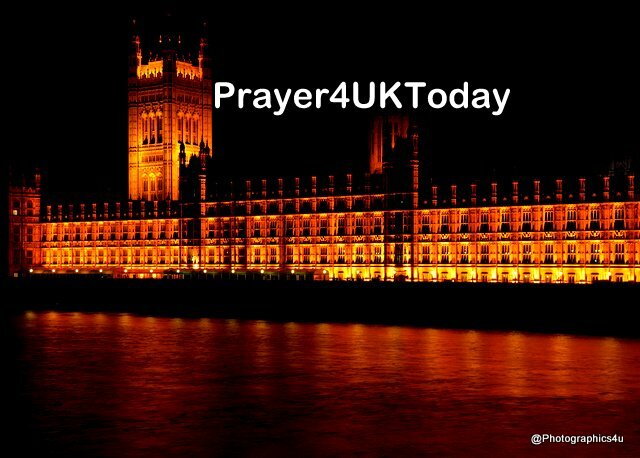 Heavenly Father, we look to and celebrate all that You are doing in our UK's Medical Mountain! Father, we bless Sacha and Whitestone Surgery and ask for continued favour outpouring from Heaven: That social prescription will spread like wild-fire across the Nation blessing the people, economy and inheritance of the United Kingdom. For Linda's salon, Dawn's initiative and all those across the country whom You have given a heart to reach out to the mentally ill, dear Father, we ask that You bless them, be their strong arm of support, and lock their arms together. Continue to bring all those in isolation out into loving community fellowship. Father, we thank You that you have heard, and continue to hear, the heart cries of Your people for our beloved land. Holy Spirit, we thank You that you are on the move! King and Governor Jesus, we thank You that Your pockets of light are breaking through the darkness! You are the bright blue hope, bursting through the midst of the cloud-covered sky. Father, thank You that YOU are shaping our land! Let us not miss the treasures -Your hidden rainbow meadows. Let us not pass them by LORD. Help us, in our travailing, to stop and rest in you: To have hope for our future restored by seeing what You are doing and speaking those things into being that You would have us prophecy. Let hope and faith arise, in the Name of Jesus - Warrior, Redeemer, and King over all! We declare the sound of the victory of Jesus, will be heard over this land, as worship rises from the hearts of those who love You. We praise You for Your hand upon this nation, for the place it has in Your heart and for the purpose for which You have called it. Lord we thank You for every promise You have given concerning Revival and Awakening in this nation. We praise You for new levels of unity, for the depth of Your word and the sensitivity to Your Spirit which are increasing in our land. We decree in this day, every negative word, perspective and expectation will be overwhelmed as the God given identity for this land emerges - we declare it will be spoken upon the streets and released even through media. We declare in this atmosphere of worship, fresh joy and fresh strength will be released, even within Parliament, that the hearts and minds of every Minister, MP and Civil Servant will be surrounded and protected, and every weariness, confusion, doubt and fear lifted. We speak fresh strength and clarity to each one, that they will know Your will and align with Your Spirit. We thank You for the armies of heaven aiding Your purpose at this time. Now over every discussion, debate and vote, we declare the God given sovereignty and order of governmental authority over and throughout the UK Parliament will be established and all planned legislation and treaties relating to the implementation of Article 50 completed according to His timing and design. Please pray for a 22 year old Christian young woman who has been told by her Consultant that the cancer she had thought was over has come back and is affecting both her lungs. She has only a few months to live without chemotherapy and 6 to12 months to live with. Please pray as the Holy Spirit guides you. We can pray for the Power of God to be present to bring healing, wholeness and restoration from the top of her head to the tips of her toes. Let us also ask for our Father’s Shalom Peace to fiil her and bring His Peace to every area of her body, soul and spirit. Finally let’s ask for her to be filled with the Holy Spirit so that what’s not of the Holy Spirit will be thrown out in Jesus Name Amen. We declare in this nation, a new generation of children and young people are arising who will encounter Jesus, be impacted by His radical love and run with radical obedience to God’s Spirit. We declare they will be voices of hope to the generations, recognising and grasping the season of openness upon the land. According to Your word in Psalm 145:4” One generation shall declare Your works to another”, so, in this new day, we decree and declare this new generation will understand the Godly heritage of the nation, the Biblical foundations under it and of the principles released through it; that as Your church rises to meet the challenges of the season, every anointing, whether of individuals, generations or land, will be recognised and released, in the Name of Jesus. We decree and declare young people in our nation, towns, churches and families will have an understanding of the times and seasons, and of the power of choice. We speak maturity to them in their political awareness and social engagement. In the Name of Jesus, we declare an increased rising up of those who will pioneer and stand for Godly principles and for the good of the people, and we speak favour and divine revelatory wisdom to those already positioned. Now, even as individuals are sifted and challenged, we release God’s ways and thoughts to every member of the House of Commons, and we decree those chosen and appointed by Him will rise to a new level of authority, wisdom and stature, that they will speak and lead according to His purpose, as a new sense of destiny and calling rises upon them. We continue to declare a mantle of Godly wisdom will rest upon Theresa May, upon the Speaker of the House of Commons, and MP’s of all parties, aligning every word and decision with His will, and we decree and declare every plan purposed under heaven for this nation will stand strong and secure, as every scheme of man and the enemy is blown away by the breath of His mouth.